Home › Latest News › Making Samkelo's Dream Come True! Making Samkelo's Dream Come True! On the morning of 28 February, we had another incredible opportunity from the Reach for a Dream Foundation to assist in making a child's dream come true! Below is the letter from Kholiswa Nonkwelo (Dream Coordinator PMB) about Samkelo and his experience. I would like to thank you for all your help in making sure that Samkelo's Dream came true on Tuesday. Samkelo is a 5 year old boy who was diagnosed with cancer of the brain at the early age of 3. He lives in Pietermaritzburg with his mother and father and has 2 other siblings. It has been a roller-coaster for Samkelo concerning his health issues, but that doesn’t stop him from being a very energetic, loving and bubbly child! 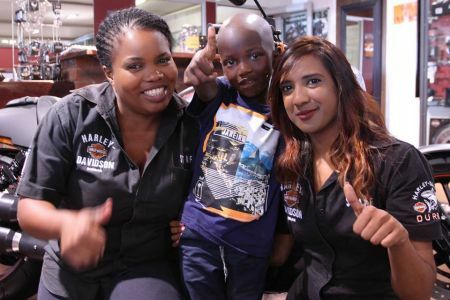 He strives to look forward in life with positivity and with Harley-Davidson Durban being able to fulfill his dream, it increased his hope and inspiration. We, at Reach for a Dream Foundation, would like to thank you and your team for helping us with Samkelo’s Dream. You certainly did an awesome dream for this young boy!"